I have roughly 649 things that I could/should be doing right now. I really wish that were an exaggeration! We got home from our 3 week vacation early Monday morning and the last few days have been spent trying to bring some semblance of order back into our home. It's always nice to go away, but it feels like it takes so long to get back into a normal routine. I have plans to post more about our trip later...more precisely, when my brain starts to function again and I get my pictures off the camera. Your guess is as good as mine for when that might occur. In the mean time....here are some things I am loving right now! 1.) Do you know about Tog + Porter? I am kind of obsessed with this idea right now. Basically, you sign up and set a clothing/accessories budget (from $200-$1500). They pair you with a personal stylist, whom you meet over skype to discuss what you are looking for in terms of your styling session. They send you a box full of awesome things to wear and you try it ALL on and you meet with your stylist again (via skype) to show her what did and did not work for you. You keep what you want and return what you don't (for free). I love this idea because I have become anti clothes shopping lately. It's so frustrating finding things that fit, that are comfortable, and are conducive to spending the majority of my time with a toddler. As I have mentioned before (and for those of you who see me on a regular basis)...I tend to live in yoga pants. (Confession: today I made myself take a shower, do my hair and makeup, and get dressed because I couldn't remember the last time I put on makeup or actually dried my hair). Yep, I'd say its about time for some professional help! 2.) This makes me laugh...mainly because I'm not from the south. There are a lot of things that I have become privy to since living in Memphis that I don't think I will ever fully understand. 3.) I came across this recipe on pinterest right after Thanksgiving and have found a new favorite! Also, lets stop for one second so that we can talk about the fact that my computer's autocorrect just recognized pinterest as an actual word. 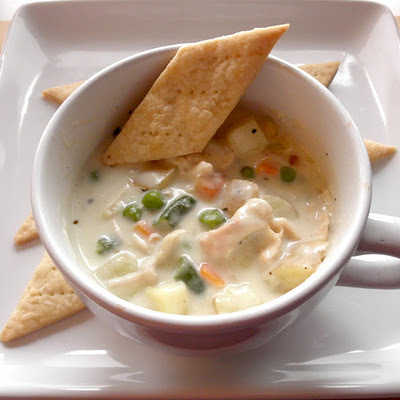 Okay, back to the point at hand...It's chicken pot pie soup, so that alone should be enough reason to try it! The first time I made this soup I substituted turkey for chicken, because I had a ton left over that I needed to use. It was still delicious! I have since made it with chicken and yum. Just yum. It's super quick and easy and it freezes really well! Try it. You wont be disappointed! Heyyyyy.. Following from the Memphis Bloggers group. Is your blog on BlogLovin? I couldn't find it. What about Instagram, are you on there? Heyy Terri! I am still trying to get this up and going! I just linked up to BlogLovin and I do have instagram....just figuring out how to link that as well :-) I'm a work in progress for sure! 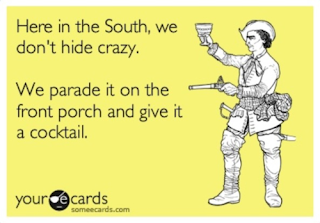 Parading crazy around on the front porch is definitely true of the South, and it always makes me thinks of the drunks on the tv show Cops. Ha!